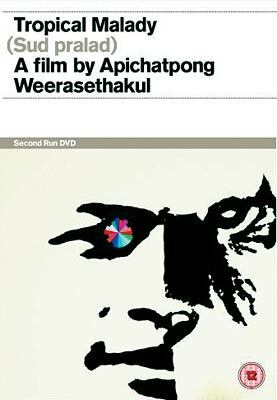 Thai architect, artist, writer and filmmaker Apichatpong Weerasethakul has made a handful of experimental documentaries and fictional films that are so wayward and quirky in structure that they fundamentally make one question the boundaries of the filmic form. Openly gay, Weersethakul’s films are frequently categorised as queer cinema, giving his remarkable work a minority and marginal appeal. He is best known for his endearing, perplexing and beautiful 2002 romance Blissfully Yours. Divided into two parts 2004’s Tropical Malady tells, firstly, the seemingly innocuous tale of the relationship between a soldier and a young village boy and in the second part adapts a Thai folk tale about a soldier hunting down a shape shifting shaman. Both parts star the same actors in seemingly different but oddly familiar roles and both sections boast an excruciatingly slow pace. This is cryptic and challenging cinema but, approached with patience and a broad mind, it is also oddly satisfying and lyrical. Extras include the DVD premiere of Thirdworld, Apichatpong’s 1997 short film, a newly filmed interview with the director and a booklet featuring a new essay by film historian and author Tony Rayns.